The indefinite chain strike of refugees from Pakistan Occupied Kashmir (PoK) demanding relief on par with Kashmiri Pandit migrants entered 7th day here on Wednesday. 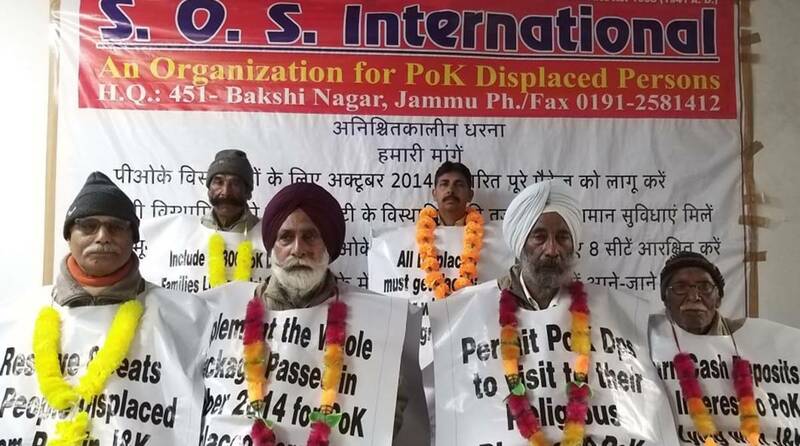 The sit-in strike has been organised by the SOS International, an organisation of PoK refugees. Rajiv Chuni, President of the SOS International, said the BJP government at the Centre and the J&K government were treating the PoK refugees as children of lesser gods while Kashmiri Pandit migrants and their children were being provided cash incentives and reservation in professional institutions. Chuni regretted that the government was discriminating against the PoK refugees vis-a-vis the Kashmiri Pandits. He said the current agitation was in support of the demand for implementing the cash package of Rs 25 lakh for each refugee family that was approved by the National Conference-Congress coalition government in 2014. The Narendra Modi government cut the package to Rs 5.5 lakh, and there had been discrepancies in payment during the past nearly five years, he said. Chuni demanded that the nearly 5,300 families of PoK refugees who had been settled in other states should also be registered as refugees as they had illegally been deleted from the list. He also demanded that the 8500 posts reserved in government departments for PoK refugees by the then NC-Congress government should be filled up by giving employment to their wards. The refugees were also demanding that at least eight seats out of the 24 reserved for PoK in the state Assembly should be earmarked for the PoK refugees who migrated here 71 years ago. The SOS International has also sent a representation to the election commission in this regard. They are also demanding that the money left behind in the accounts of the refugees in the J&K Bank branch at Mirpur in PoK should be paid to them by the bank.